Can you tell us about the development of your protagonist Beth? She began as a voice that visited me late one night and refused to let me go. As the novel developed, so did she; once I’d finished a draft, I went back and edited the parts where she had got tangled up with me. What research did you undertake to complete All the Good Things? What has completing and publishing a novel taught you? That completing and publishing a novel won’t make you feel whole or catapult you into some other dimension of happiness (as yours years of wanting it may lead you to believe). But that speaking to readers who have really read and connected with your work makes it all worth it. What are your all your good things? People you can be yourself with; bubble wrap (& popping it); running and swimming and walking; peanut butter; music; and of course BOOKS. 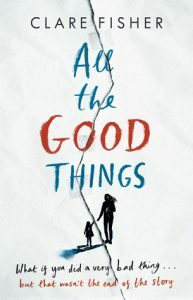 Without giving anything away, the ending of All the Good Things took my breath away. Without you giving anything away either, was the ending always going to be as it was or did you have alternatives? It was always going to be that way – the ending was one of the v few things I knew to start off with. However I wanted to make the alternative possibilities palpable. The novel is a bit of an homage to south London. Tell us about how you defined the novel’s setting. I grew up in Tooting and south London is in my bones. I wrote the novel after moving to Leeds so I suppose it is a love letter to the place – sometimes it’s easier to see things when you’re further away from them. What can readers expect from your short fiction collection How The Light Gets In, coming in 2018 on Influx Press? The stories are VERY short – they grew out of a live art project and they contain a wide variety of voices and happenings. They are stranger and more playful, but reading back over them recently, I could see some crossover concerns with the novel. What contemporary writers inspire you? So many! I love the Smiths, Junot Diaz, Lorrie Moore, Claire-Louise Bennet, Nicole Krauss… Anything with a strong and engaging voice. I’ve got the stories and the paperback of my novel out this year and am working on my next novel. I’m also looking forward to doing more creative writing teaching and mentoring. I’ve also just embarked on a period of collaboration with a biological scientist at Leeds University as part of a project to foster closer relationships between arts and sciences – it’s proving v interesting so far!